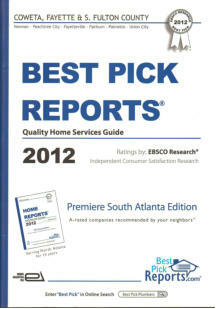 2012 is the first year this publication has been offered in Coweta, Fayette, South Fulton, Henry and Clayton counties. This book is a well known, trusted source for home services in Atlanta and many other highly populated cities all over the United States. We are really excited to be a part of this. As you may know, companies must receive an A-rating based on more than 100 reviews to be included in Best Pick Reports. We are extremely thankful that our customers know and appreciate the work we do for them! Check out their website, where you can find information on a mobile app, and research all of the other companies in your area.